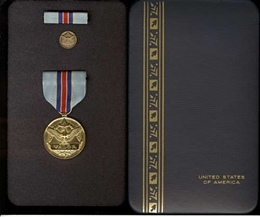 Air Force Civilian Award For Valor awards are sold one per pack. The box set consist of the large medal, lapel pin, and ribbon mounted inside the presentation box. Manufactured in the USA. Air Force Civilian Award For Valor is given to employees who exhibited great courage and voluntarily risked personal safety beyond the call of duty such as approaching or entering a burning aircraft in an attempt to rescue trapped victims.